In almost every mixed drink I have encountered, there is a perishable ingredient, something that is just slightly inconvenient to keep fresh and on hand. If it isn’t fresh citrus juice, it is fortified wine, and if it is neither of those, it is some kind of dairy ingredient. Even an old fashioned cocktail, or a Sazerac isn’t really complete without a slice of fresh citrus peel. 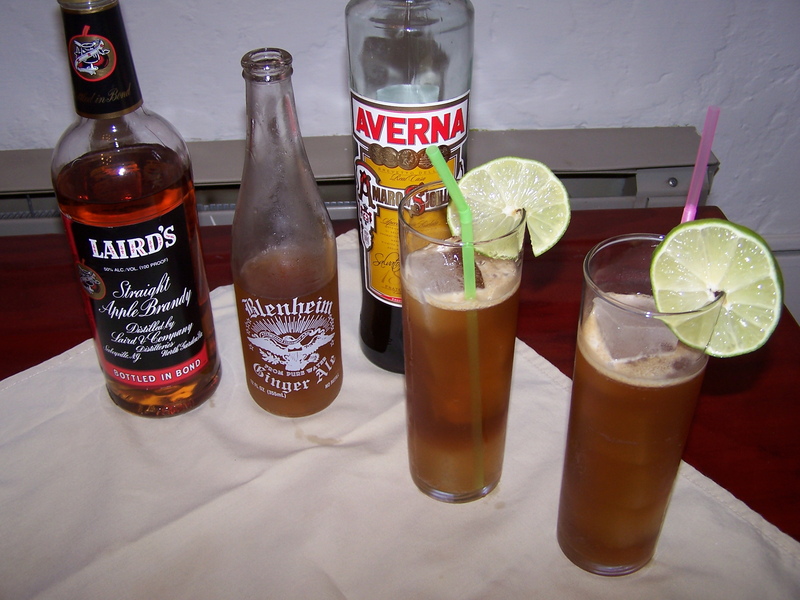 David Embury divided mixed drinks into two broad categories: Sour and Aromatic, the former depending upon sour citrus juice, and the latter depending upon fortified wines and bitters. There are other mixologists with other ideas, but at the end of the day you’re pouring sugared and flavored ethanol, and it’s not as if all of these categories exist in some discoverable form in nature, the way subatomic particles do. Anyway, fortified wines will live a lot longer in your fridge than fresh lemons will in your fruit bowl, and it is both easy and refreshing to make a drink that contains only spirits. I think many drinkers neglect the aromatic style, either because they mistakenly believe that they dislike vermouth, or because they have never seen how rewarding an aromatic cocktail can be. Technically speaking, only aromatic mixed drinks are cocktails, and only a subset of them, for that matter. Last Thursday I was in the mood for an aromatic drink using apple brandy, and I invoked my favorite 6:3:1 formula for a quick tipple. Stir over ice and strain into a coupe glass. Drink in the Spring time. This was a warming drink, and it felt like something you would sip on a crisp fall afternoon. I made this drink several weeks ago, when it was still technically spring, so it was deliciously out of season, not because the ingredients were unseasonal, but because the flavors were. The Cardamaro lent a round, herbal flavor to the sip, which was complimented by spiced apple on the swallow. Categories: original creations | Tags: allspice, allspice dram, allspice liqueur, amaro, angostura bitters, aperitif, apple brandy, applejack, aromatic, bitters, booze, brandy, calvados, cardamaro, cocktail, cocktails, drinking, drinks, fortified wine, mixed drinks, pimento dram | Permalink. Another one I found via Looka, the Diamondback is a drink to be reckoned with. I looked up this drink on the internet, and I found that most people say to stir it. That is certainly what intuition would suggest, as the drink contains only spirits, but the instructions at that particular blog said to shake it. I was intrigued by the idea, because it goes against the norm, and I was actually very glad I did. The aeration and texture of the drink were a pleasant change of pace for an aromatic cocktail, and it helped to tame the burn of rye+brandy+green chartreuse, which is a very high proof mixture. The Diamondback is probably not for the faint of heart, but I always find green Chartreuse has a cinnamon flavor hiding in all of those herbs, and with the spice from the rye and the apple, I felt like I was drinking an apple pie. The blend of flavors was exquisite, and elegant. Chuck Taggart mentioned that he had this drink at the Zig Zag Cafe, and after I made it, I realized that so had I, but I didn’t remember. It’s hard to know for certain, but I think I had it shaken there, too. The general rule is that you should only shake a drink if it contains fresh juices or thickening agents such as cream or egg, and otherwise it should be stirred or swizzled, or occasionally built. Once in a while, it’s good to break the rules. The lack of bitters in this drink is intriguing, as most aromatic cocktails benefit from the bassline flavors of a cocktail bitter. 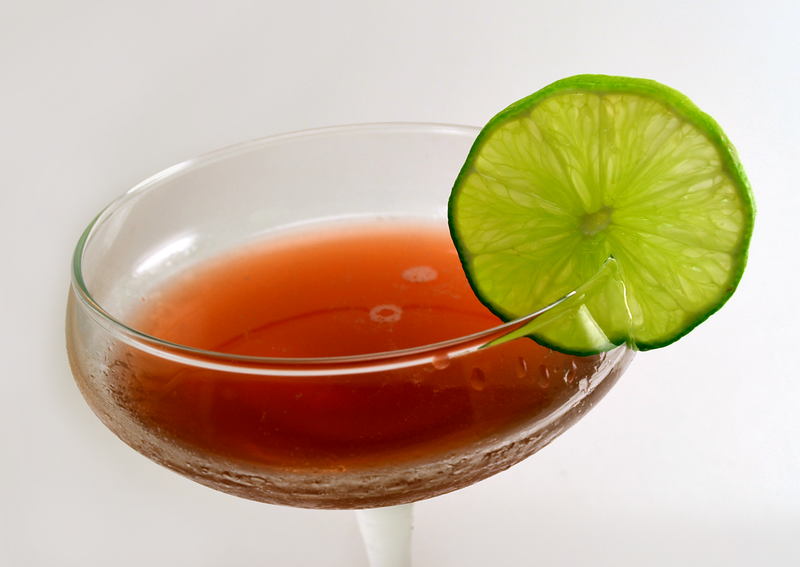 In fact, a drink is not properly labelled a cocktail if it contains no bitters, so the Diamondback is not a cocktail in the David Embury sense of the the word; rather it is an ensemble, which is a mixed drink made exclusively of spirits, often sweet enough to be served as dessert. 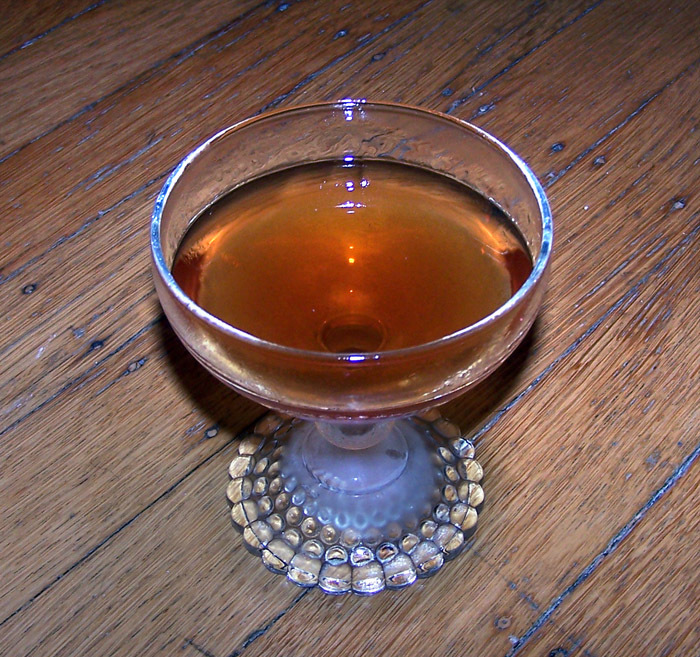 Categories: classics | Tags: apple brandy, green chatreuse, rye | Permalink. Sometimes the drink you end up making is not the one you were expecting. I was planning to make a drink with dark rum and Cynar this morning, but last week I bought a bottle of Laird’s bonded apple brandy, and I was just itching to mix with it. I’ve tried Laird’s applejack in the past, but it was a mediocre product, astringent upon the palate and disappointing in its concentration of apple flavor. The bonded version was slightly more expensive, but it is bursting with good apple flavor, and smooth enough that I was not offended when I sipped it neat. Creating your own drinks on the fly is always a lot of fun, because it teaches you much more about mixology than just making someone else’s recipe. The end result isn’t always good, but it’s always an opportunity to learn. This drink is technically a charged punch, meaning the aqueous element is carbonated, and the primary components feature citrus juice prominently. I’m terrible at naming the drinks I make, so I just call them what they are. Shake all except ginger beer, strain and pour over fresh ice. Insert a straw through an apple wheel for a garnish, and then let a few drops of lemon juice coat the apple to prevent browning. For my personal taste, a drink without a bitter component is usually not very interesting, which is why I stock a large variety of amari. When I first tasted Averna I did not care for it, as I thought it had an off petrochemical note. Moreover, I dislike the mouthfeel of caramel coloring, and it was clear to me that the makers of Averna had added some. The flavor eventually grew on me, as most spirits do, and I now reach for it when I am looking for an element of burned caramel. I made the shaken portion of this drink in a ratio of 6:3:2, which I have found works very well for base spirit:liqueur:sour type potions. The intensity of the citrus flavor will often overpower the liqueur if they are used in equal measure, and this is easy to account for. The most important thing to do when freestyling a drink is to constantly taste it as you add each new ingredient. Whatever it tastes like before you shake it, it’s going to taste pretty similar once it’s cold. Dilution and chill will modify the flavor a bit, but you can be confident that if it tastes great before you shake it, it will taste great after. I purchased a bottle of Rachel’s ginger beer a couple of weeks ago, knowing that I would use it to top a cocktail at some point, and I thought it would be just the thing to turn this into a long drink. Rachel’s is a local brand of Seattle ginger beer, but I was dismayed to discover that they add lemon juice to their product before bottling. It makes their soda complex and dry, but it completely clobbered the subtler flavors of Averna and apple. My first shot at this drink left me dissatisfied, so I bought a bottle of Blenheim ginger ale, which is by far the best commercially made ginger ale, owing to its supreme ginger heat. It lacks the rich flavor and body of a ginger beer, but it has a spicy effervescence that fills my sinuses when I sip it plain. 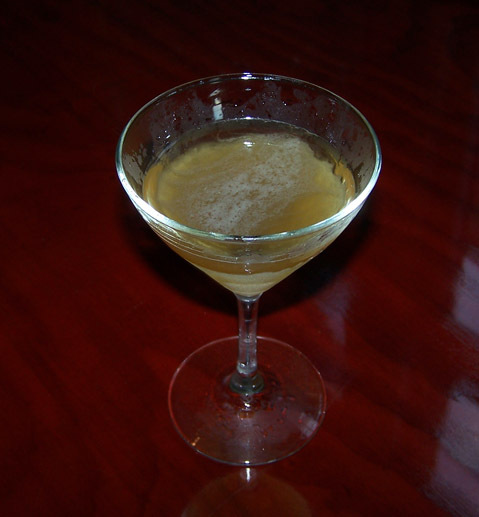 The lighter flavor of the Blenheim proved to be a perfect match for this combination of ingredients, with the ginger taking a back seat to the caramel apple flavor, while still contributing a spice note after the sip. I didn’t have any apples for round two, so I was forced to make do with a lime wheel. Shake all except ginger beer, strain and pour over fresh ice. Insert a straw through an apple wheel for a garnish, and then let a few drops of lime juice coat the apple to prevent browning. This drink is perfect for summer, and soothing to the digestion. 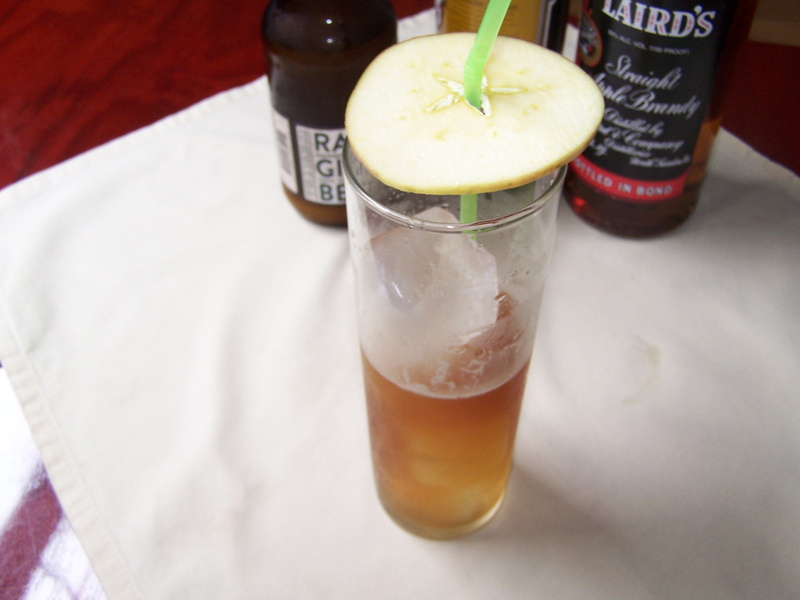 Categories: original creations | Tags: apple brandy, ginger beer, original | Permalink.